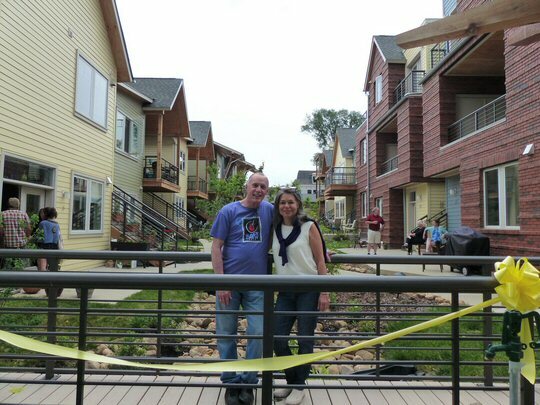 On Saturday, April 30 the newly completed Germantown Commons community in Nashville celebrated National Cohousing Open House Day by inviting the public in to see its revolutionary approach to residential reform in Music City. This first cohousing community in Tennessee is the brainchild of Diana Sullivan whose organization New American Villages spearheaded the development. Bob Teague and Diana Sullivan celebrate the completion of Germantown Commons. The National Cohousing Open House Day put on display exactly why interest in cohousing has surged in recent years: Baby boomers seeking to downsize and connect more with neighbors; Socially-conscious people wanting a community-oriented and environmentally-friendly lifestyle; and, Millennials wanting a better way to raise their families and collaborate with neighbors. Cohousing communities are intentional, collaborative neighborhoods that combine extensive common facilities with private homes to create strong and successful housing developments. Cohousing communities are part of the new cooperative economy and are predicted to expand rapidly in the next few decades as individuals and families seek to live more sustainably, and in community with neighbors. Since the first cohousing community was completed in the U.S. twenty-five years ago, more than 160 communities have been established, with more than a hundred in development. Small and large, urban and rural, newly built and retrofits, these communities have consistently been at the forefront of environmental and socially sustainable neighborhoods. Germantown Commons, twenty-five condos and common house, was initiated, designed, funded and built by the residents of the community. Resident groups in Nashville are planning additional communities.